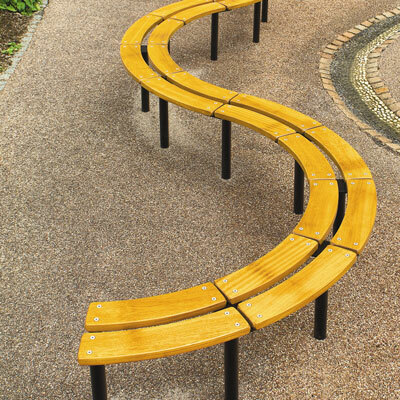 A very cost effective modular seating system using standard board sections of wood or steel which can be straight, mitred for corners, or curved in eight different radii. A wide range of interesting and organic shapes can be made by combining standard board sections to make circles, part circles, squares, horseshoes, ovals, snakes and more complex arrangements, limited only by the scope of your imagination! Board sections can be manufactured in non-standard radii and lengths too, at additional cost, making the possibilities almost endless. Each board section consists of a pair of 145mm wide boards in wood or three 100mm wide boards in steel. To make costing simpler all the standard sizes of board sections are the same price, in each material and thickness. The standard frames are of three types: intermediate frames, end frames and corner frames. Intermediate frames and corner frames have wider head-plates to take two sets of boards. End frames are inset by 50mm from the end of the board section when linear arrangements are specified. Frames can be finished in Acrylic Coating, Street-Tough finish or made from stainless steel. Stainless steel frames are in satin polished grade 316 and are suitable for higher profile enhancement schemes. 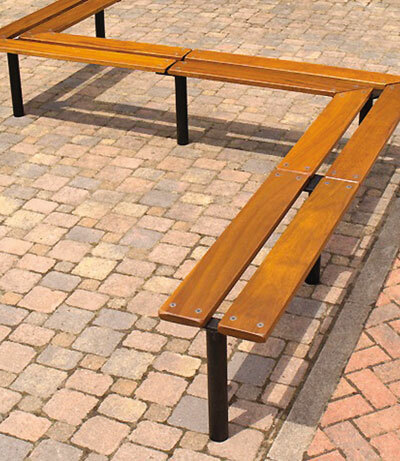 Because of the often substantial size of an assembled bench unit, and the need for a flat ground surface if they are to be bolted down, (which is rarely achieved) these bench units are easiest to install if specified with extended legs to concrete in. 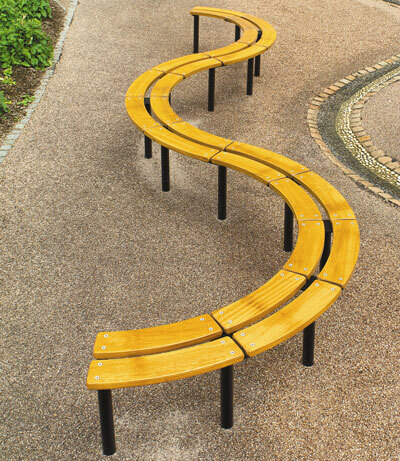 Curved board sections are also used in our picnic sets. 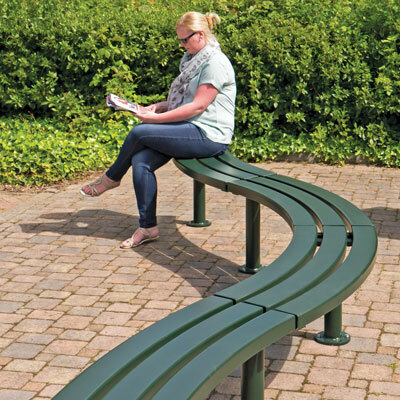 Our Universal Bench steel board sections are incredibly robust and enable attractive curved seating, painted in infinite combinations, they can introduce a real splash of colour.